The agency — long a source of controversy no matter which administration runs it — could soon be up against Democratic committee heads eager to hold hearings and subpoena documents. Trump's plans for EPA, including reshaping the workforce, overhauling the use of science and rolling back Obama-era regulations, will all get heavy scrutiny if the House flips to Democratic control next year. It would be a new day for EPA — one where members of the opposition party shed new light on what the agency has been doing during the past two years as Republicans ran both houses of Congress. "I would expect very aggressive oversight finally being asserted by our committee," said Rep. Gerry Connolly (D-Va.), who sits on the House Oversight and Government Reform Committee. "The Republicans have just gone totally dark and quiet. They see and hear and speak no evil when it comes to the Trump administration." Increased scrutiny from a Democrat-led House would come at a vulnerable time for the agency. The clock is ticking on how long acting Administrator Andrew Wheeler can remain atop the agency. He could have to step down as early as next February, although Trump has signaled he'll nominate Wheeler to keep the job. Nominees to lead the agency's chemicals, international affairs and solid waste programs are still waiting for confirmation. Other high-level EPA jobs might be tough to fill if Democratic-run committees in the House make life difficult at the agency. Trump still hasn't nominated anyone to lead EPA's offices for environmental information, human resources and research. Vacancies might add up if other political officials at the already short-staffed EPA head for the exits. Bob Sussman, who served as senior policy counsel to Obama EPA Administrator Lisa Jackson, said the midterm elections can serve as a time to leave for appointees at the agency. "There are always some people that the two-year mark is a natural point to move on," said Sussman, now a consultant. If Democrats wield gavels in January, they're expected to haul agency leaders before them frequently, just as Republicans did when the chamber flipped during the Obama administration in January 2011. Wheeler can expect to spend plenty of time on Capitol Hill, said former Rep. Ed Whitfield (R-Ky.), who led the Energy and Commerce Subcommittee on Energy and Power from 2011 until 2016. "I think he'll be up there a lot," said Whitfield, who's now a lobbyist at Farragut Partners LLP. "Basically, all you can really do is try to hold their feet to the fire and try to make the public aware of what's going on." Obama EPA chief Jackson was summoned to testify before Whitfield's subcommittee in early February 2011, a month after the GOP took control of the House. It was a heated hearing over Republican legislation to block EPA from regulating greenhouse gases under the Clean Air Act (Greenwire, Feb. 9, 2011). Those oversight hearings were effective, Whitfield said. "You know how regulations are. It's so boring, and people pay so little attention to it." But "if you have hearings and you have people testifying and you get a little news coverage, then you use those hearings back in your district." Republicans' efforts "contributed to the animosity by a lot of people about federal government as President Obama was leaving office," Whitfield added. As for whether those tactics will work for Democrats, he said, "It's just how aggressive do they want to be and how astute are they in setting it up, and they're probably pretty astute." Democrats want to scrutinize EPA's policies as well as its management. Connolly, who's now ranking member on the Government Operations Subcommittee, said "a good road map" to understand what Democrats would do with the oversight panel is its members' subpoena requests that were rejected by Republicans over the past two years. "I think that gives you a good strong basis to speculate where we'll head in the next two years as a committee if we're in the majority," Connolly said. "But our big challenge is going to be prioritizing, right? It just can't be sort of scattershot. We're going to have to take that list and prioritize." Democrats on the committee requested 64 subpoenas since the start of the Trump administration. Several dealt with the White House, while others focused on the 2020 census, immigration and health care, among other scandals. At least two of those subpoena requests were related to EPA. One asked for documents on the agency's handling of Freedom of Information Act requests. The other sought Federal Deposit Insurance Corp. records on Albert "Kell" Kelly, an EPA senior adviser who was banned from the banking industry and has since resigned from the agency. Under Chairman Lamar Smith (R-Texas), the House Science, Space and Technology Committee was also known for its aggressive oversight. Smith even used subpoena power to go after Obama EPA Administrator Gina McCarthy's text messages. Democrats may take a different tack. Rep. Don Beyer (D-Va.), who sits on the Science panel, could not say whether the committee would use that authority if Democrats retake the House. "Yeah, there could be, although I can't tell you right now what particular subpoena that we would issue," Beyer said. "Obviously, you start with the invitation. If they ignore the invitation, then you move to the subpoena." Beyer, who serves as ranking member on the Oversight subcommittee for the House science panel, said he wants "to look at the many changes in the EPA since Trump took office, first with [former EPA Administrator Scott] Pruitt and now with Andrew Wheeler, that are really upsetting." He added, "The major theme is the de-emphasis of science and the emergence of what seems to be undue attention to industry concerns." Beyer wants "a two- or three-hour hearing" on an EPA proposal to consolidate its science adviser's office into its larger research division. He also wants to look at the administration's moves on EPA's science advisory committees, including its disbanding of a review panel on particulate matter air pollution standards. Connolly has questions about EPA's reorganization plans, which include realigning regional offices to headquarters' functions. "What is the rhyme and rationale for that? And what would be the practical implications of that? We obviously are suspicious that all of this is designed to lower EPA's profile and to diminish its ability to protect the environment," he said. Connolly also said if Democrats take the House, EPA will face oversight on climate change rules, enforcement of clean air and clean water rules, and its use of science. He also anticipates scrutiny of how Trump appointees have managed the agency. "The enormous loss of talent, a lot of people going out the door because of disgust and dissatisfaction with the policies coming out of the administration. How rulemaking is arrived at with this crowd and how they are or not complying with the law," Connolly said. Joe Goffman, then a top air adviser at EPA when Republicans gained power after the 2010 elections, remembered the scrutiny from the Oversight panel under then-Chairman Darrell Issa (R-Calif.). "You had a committee using its investigatory powers to interject itself in a rulemaking. They were not looking at management or practices. They were treating a rulemaking as a form of malfeasance or misfeasance," said Goffman, now executive director of the Harvard Law School's Environmental & Energy Law Program. "They were treating the rulemaking process as if the agency was engaging in some sort of misconduct." He added, "It required a lot of response." Rep. Betty McCollum (D-Minn.), ranking member on the House Interior, Environment and Related Agencies Appropriations Subcommittee, said she expects EPA to be more responsive to her requests if she takes over the panel. "Well, first we need some transparency so we can do the oversight," McCollum said. "My expectation will be if I send a letter of inquiry to acting Administrator Wheeler about how funds are being spent or something that I've heard isn't being done in the spirit of putting scientific evidence first, I'm going to expect an answer right away." McCollum, who fought back against Trump's proposed budget cuts to EPA, said she doesn't believe the agency has enough money to fulfill its mission and she will be watching how those taxpayer dollars are used. She expressed concern over EPA's decision to place Ruth Etzel, the head of its children's health office, on administrative leave, which the agency says was due to allegations related to Etzel's leadership. Scott Fulton, who was EPA's general counsel under Obama, said Democrats will need time to get "the oversight machinery" up and running again if they take the House. He said lawmakers' requests would add to the agency's workload. "Most administrations feel like they have not been doing anything that — exposed to the public — would cause any great concern," said Fulton, now president of the Environmental Law Institute. "Instead, it's like, 'Gee, along with the million other things we have do, we have to respond to all of these hearing requests and document requests.'" To deal with the GOP-led House, Fulton remembered reworking the general counsel's staff in 2011 to create a leadership group to respond to congressional oversight on behalf of EPA and assigning a top official as the agency's point of contact. "The reason for that was to preserve our capacity to do the other work," Fulton said. Joe Brazauskas, formerly staff director and senior counsel for the House science panel's Environment Subcommittee, has recently joined EPA's legal office. He is well-versed in oversight of the agency's programs, and as associate deputy general counsel, he has been designated at EPA to cover congressional oversight along with other issues, according to an internal email. Pruitt — who caused some of EPA's biggest headaches since Trump took office — has been out of the national spotlight for months. Democrats bashed Pruitt almost daily over alleged heavy spending and mismanagement at EPA. He resigned this July as investigations began to pile up. But Connolly thinks Democrats will revive those issues. "I would also expect, frankly, to see some further hearings on the outstanding ethical issues involving the previous administrator, Mr. Pruitt, that have not been resolved and our committee has done almost nothing about it." Rep. Trey Gowdy (R-S.C.), chairman of the oversight panel, did open an investigation into Pruitt, asking for documents related to his travel and security as well as having staff interview senior EPA officials behind closed doors. That investigation is ongoing, a Republican committee aide told E&E News. Connolly acknowledged a Democratic-controlled House could call the resigned EPA chief back to testify. "I don't think that's impossible. I don't want what Pruitt did to be forgotten because he finally resigned," Connolly said. "I know there are lots of others who feel the same way, so I don't think we will let that go — in what form we do that remains to be seen." The EPA inspector general still has several open reviews related to Pruitt, including focusing on travel, preservation of emails and text messages, and use of a special hiring authority at the agency, which are expected to be released later this year or early next year. In addition, CNN reported yesterday that the Justice Department had opened up an investigation of Pruitt after receiving a referral from the EPA IG, which has seemingly stalled since he left the agency. EPA IG spokesman Jeff Lagda told E&E News he could neither confirm nor deny the existence of a criminal investigation. Other Democrats are less eager to pursue Pruitt now that he is gone. Beyer said, "We're not going to retroactively prosecute Pruitt for all the wacky things he did." He noted there were bigger concerns with Pruitt at EPA regarding staff morale, employee turnover and downplaying of science, all of which can affect public health. "We also accomplished [our] goal, which is to get him either to clean up his act or go, and he left. 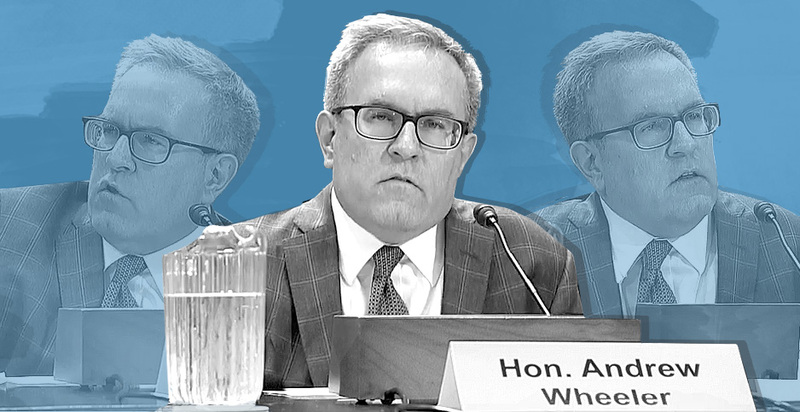 I don't agree with everything that Andrew Wheeler's done, but I certainly haven't seen him with the incredible sort of megalomania, maniacal abuse of power that Pruitt had," Beyer said. McCollum said she would move forward on overseeing EPA if she takes charge of the Appropriations subcommittee. "I have a lot of work to do," she said, citing EPA rolling back regulations as well as sidelining Etzel. "I want to make sure that I'm doing everything I can to work with my colleagues in Congress to protect the public health."